In 1974, Rep. Lawrence Hogan Sr. became the first Republican member of the House Judiciary Committee to call for President Richard Nixon’s impeachment. Now there’s speculation in Washington that his son, Maryland Gov. Larry Hogan, might challenge President Trump in the 2020 Republican presidential primary. So we decided to take a look at what might prompt Hogan to run and how he might fare against Trump. Hogan would not have an easy go of it, but we can see why he might run — and why he might find some success. First, a look at his record. Larry Hogan became the governor of Maryland after pulling off an upset victory against Democratic Lt. Gov. Anthony Brown in 2014. In 2018, Hogan cruised to re-election, winning by 12 percentage points despite Maryland’s deep-blue hue and a Democratic-leaning national environment. Hogan was the first Republican governor to win re-election in the state since 1954. But that came as no surprise: Just before the election, Hogan had the second-highest approval rating of any governor in the country, at 67 percent, according to polling by Morning Consult. Hogan can’t run for governor again because of term limits. 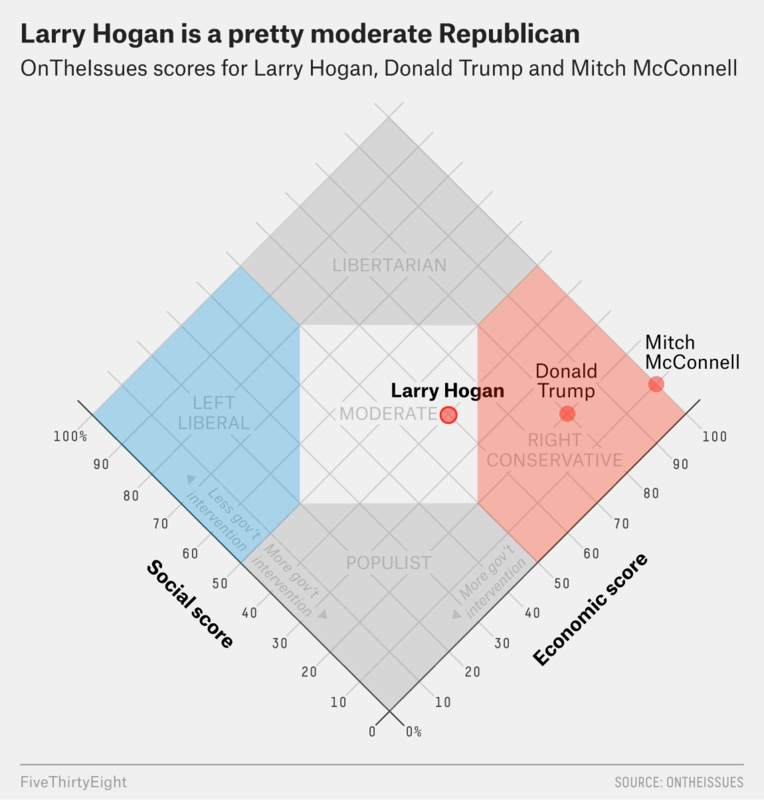 According to OnTheIssues, which tries to measure a politician’s positions based on votes and public statements, Hogan’s views are notably more moderate than those of either Trump or Senate Majority Leader Mitch McConnell — the most powerful Republican in Congress — which might help explain Hogan’s continued success in Maryland. His candidacy also had a feel-good element: Hogan overcame cancer during his first term — twice, actually. Practical considerations might also push him to run. Although Marylanders have sent Hogan to the governor’s mansion twice, a Senate seat might still be out of reach (partisanship tends to matter more in congressional races than in gubernatorial contests). And at 62, Hogan might feel like this is his moment to try for the presidency — not, say, in 2024, when he will have been out of office for two years. In the modern era of presidential primaries, no incumbent president has ever lost renomination.1 Heck, the last time a president didn’t win renomination was in 1884, when Republican President Chester A. Arthur lost to James Blaine at the GOP convention. Moreover, among rank-and-file Republicans, Trump’s approval rating remains high — north of 80 percent. So actually defeating Trump in a Republican primary contest would be quite difficult, based on what we know now. But if Hogan’s goal is to win a substantial share of the vote while making the case for a different kind of Republicanism, that seems more attainable. National polls find Trump in reasonably good shape against potential primary foes, but surveys suggest that at least some Republicans in the early primary states of New Hampshire and Iowa might be open to alternatives. And the president’s national numbers could present an opening. According to the Pew Research Center, in 2018, Republican leaners — independents who say they “lean” toward the Republican Party — were less likely than self-identified Republicans to approve of Trump. And among all voters — so, not just Republicans — somewhere between one-third and half of those who approve of the president’s job performance say they only “somewhat” approve, as opposed to “strongly” approve, according to recent polls. It’s possible, though far from certain, that special counsel Robert Mueller’s investigation into Russian meddling in the 2016 presidential election could help Hogan attract some Republicans if serious negative revelations about the president come out. Although polls show that most Republicans believe the Mueller investigation is a “witch hunt” and that the president is handling the matter appropriately, Trump’s numbers could worsen in the face of damning evidence and make an alternative choice like Hogan more attractive. Hogan’s centrism could also make him competitive in New Hampshire, long known for its relative moderation. Other recent Republicans running as middle-of-the-road candidates have garnered a substantial share of the primary vote there, albeit without an incumbent president in the field. In 2016, Ohio Gov. John Kasich finished second in the New Hampshire primary, with 16 percent; in 2012, former Utah Gov. Jon Huntsman, now the U.S. ambassador to Russia, finished third, with 17 percent. Still, Hogan could have a tough time breaking through. If Trump’s popularity among Republicans holds steady, he’ll go into the 2020 primary with one of the highest intra-party approval ratings of any recent president running for re-election. Also, Hogan has generally shied away from social issues such as abortion — though he’s personally against it — which means he might have trouble attracting support among socially conservative Republicans. Although that might not be much of a problem for Hogan in less socially conservative states like New Hampshire, it’s difficult to see him building meaningful support in other early primary states such as Iowa or South Carolina (if they even participate in the GOP primary in 2020). One can imagine Hogan winning over some suburban voters in the Northeast, Mid-Atlantic and West Coast, but it’s not clear that he could win a state beyond his own, which probably won’t vote until April 2020. All in all, it would be tough sledding for Hogan to defeat Trump in the 2020 GOP presidential primary. Nonetheless, he’s a popular governor who would present a clear-cut alternative to the president. So perhaps Hogan could make a splash and win over a substantial chunk of the Republican electorate. That alone would be significant: The past three presidents to endure a notable primary challenge — Gerald Ford in 1976, Jimmy Carter in 1980 and George H.W. Bush in 1992 — all went on to lose in the general election. “Modern” refers to the presidential nomination process since reforms in the early 1970s set up much of the process the two parties use today.